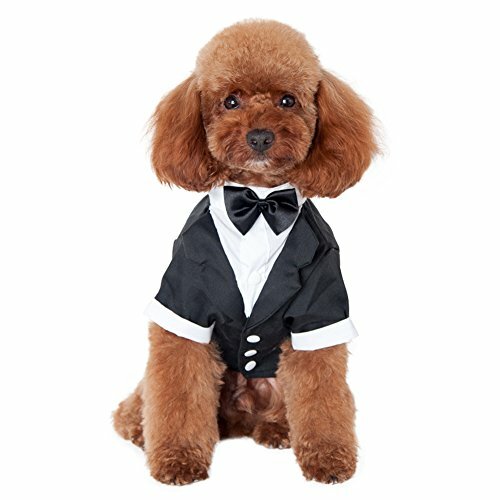 Groom tuxedos are sharp-looking suit for the dog of the hour. Groom tuxedo pairs a white satin button-down shirt with a double-breasted tux coat with tails. Comfortable, easy-fit design has a high cut belly. These clothes are the perfect size to all Large medium and small dogs. such as golden retriever, Labrador, husky, Teddy, schnauzer, Samoyed. Cocker Spaniel, Boston Terriers and Bulldogs etc, Small breed puppies, Chiwawa, Yorkshire Terrier, Maltese, Mini Pinscher, Pomeranian, mini Poodle, Jack Russel, pug, Pekingese, medium breed dog. Soft Cotton Blend material,keep your puppy more comfortable.